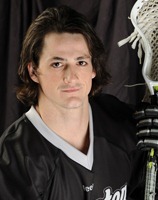 It was announced today that Edmonton Rush defender Chris Corbeil had signed with the Stockton Thunder of the ECHL and so will likely not be playing the 2013 season with the Rush. Corbeil has been one of the best young defenders in the league over the last couple of years, having been named to both the All-Rookie team in 2010 and the 2012 All-Star team. Along with 2012 Defender of the Year Kyle Rubisch, Brett Mydske, and Jarrett Toll, Corbeil was part of a young group that allowed the 2nd fewest goals last season. Make no mistake, this is a big loss for the Rush. But like any other Canadian kid who has the opportunity to play hockey at that level, Corbeil’s dream is to make the NHL, and the ECHL is the next step on his way there. Nobody can blame Corbeil for wanting to take that step. I’m sure he loves lacrosse and is (justifiably) proud of his accomplishments in the NLL, but if he has to give up either his NLL career or his chance to make the NHL, there’s no question what’s going to lose. There have been other lacrosse players who have done the same thing. Rochester’s Brad Self missed three full NLL seasons while playing hockey in Germany. The New York Islanders’ John Tavares excelled in lacrosse as well as hockey. NHL Hall of Famer Joe Nieuwendyk was a better lacrosse player than a hockey player. Other hockey players like Adam Foote, Gary Roberts, and even Wayne Gretzky all played lacrosse but chose a career in hockey. It’s sad that it has to come down to money, but the cold, hard truth is that nobody ever got rich playing pro lacrosse. If you want to make a decent living playing lacrosse, you’ll need another job while an NHL player can live quite comfortably on his hockey salary. I wrote an article on In Lacrosse We Trust about a year and a half ago comparing the money that NLL players make with athletes in other sports and it was quite an eye-opener. (Unfortunately, when ILWT changed hosting providers all of their previous articles were lost, and I didn’t save mine away before that happened.) I don’t remember the numbers, but if John Tavares the lacrosse player had made the league maximum his entire career (he hasn’t) and if the maximum NLL salary had been where it is now that entire time (it hasn’t), he still would have made less money in his 20-plus-year career than his nephew the hockey player has in two years. Of course, it’s not only about money. Many Canadian children grow up watching and playing hockey and dreaming of playing in the NHL. While I’m sure many kids grow up playing lacrosse and dream of winning a Mann Cup or an NLL Championship, it would still pale in comparison to winning the Stanley Cup. Realistic lacrosse fans know that lacrosse is, and will likely always be, a second-tier sport. As much as we’d like to believe that someday ESPN will be give the NLL the same amount of coverage it gives the NHL or NBA, we all know deep down that that’s a pipe dream. Lacrosse will continue to lose the Corbeils and John Tavares’s to hockey, that’s just reality. We can only hope that the young lacrosse stars of today are all crappy skaters. This entry was posted in Edmonton Rush, Misc. Bookmark the permalink.